A meteorite that crashed through a Virginia doctor's officelast month is now igniting a legal debate over who owns the valuable rock. The half-poundspace rock landed Jan. 18, crashing through the roof of the Lorton, Va.building and cracking into a few pieces when it hit the ground. Luckily, no onewas hurt. Shortly after it was recognized as a space rock, thedoctors, Marc Gallini and Frank Ciampi, gave it to the nearby SmithsonianNational Museum of Natural History, which offered $5,000 in return. The doctorssaid they planned to donate the money to Haiti earthquake relief efforts, theWashington Post reported. But the plot thickened: The landlords of the building wherethe meteoritelanded are claiming the doctors had no right to give the rock away, andwant it back. 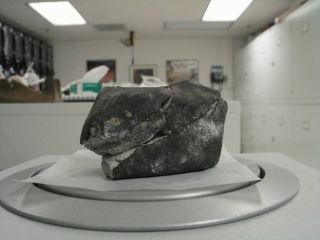 Meteorite dealer Robert A. Haag told the Washington Post theLorton rock could fetch at least $50,000. And the landlords could have a case. According to a presentation at the 64th Annual MeteoriticalSociety Meeting in 2001 by D. G. Schmitt, McEwen, Schmitt & Co. Barristersand Solicitors of Vancouver, Canada, in the United States, "a find isowned by the landowner." For now, the Smithsonian is holding onto the meteorite untilthe legal wrangling is over. The museum?s meteorite experts have said that itis very rare for meteorites to strike manmade structures on Earth. There are only three other documented instances of spacerocks falling to Earth in Virginia, museum officials said. The first was in1878, they added.